It is a home stretch for Avengers: Endgame and fans are gearing up to witness the biggest showdown of the Marvel Cinematic Universe. Ahead of the release of the film, a press conference was held in Los Angeles where chairs were left empty for all the "fallen" characters — Black Panther (Chadwick Boseman), Scarlet Witch (Elizabeth Olsen), Spider-Man (Tom Holland), Drax (Dave Bautista), Star-Lord (Chris Pratt), Doctor Strange (Benedict Cumberbatch), The Wasp (Evangeline Lilly) and Nick Fury (Samuel L Jackson) among others. The event was hosted by Jon Favreau, who has helmed Iron Man and Iron Man 2. He explained the move before beginning to host the event. "Clearly, things look a little different in a post-Infinity War Marvel Cinematic Universe," he was quoted as saying by IndieWire. "Post-snap there's a few empty seats." He was accompanied by Endgame producer Kevin Feige directors Joe and Anthony Russo, Danai Gurira (General Okoye), Chris Evans (Captain America), Chris Hemsworth (Thor), Don Cheadle (Vulture), Scarlett Johansson (Black Widow), Paul Rudd (Ant-Man), Karen Gillan (Nebula), Jeremy Renner (Hawk-Eye), Robert Downey Jr (Iron Man) and Brie Larson (Captain Marvel), who tried hard to dodge any questions that would end up revealing spoilers from the Marvel tentpole. While Larson revealed that she shot her scenes in Endgame before she began work on Captain Marvel, Gurira said that seeing a country like Wakanda, which has no history of colonisation, and playing a citizen of that nation made her feel very "powerful". In a hilarious moment, Evans almost let a spoiler slip out, but was timely cut off by Joe Russo. As Evans began speaking about the journey of Captain America, he said, “I can give broad strokes. The completion of the arc, that’s safe to say, right? This movie does provide an ending to a lot of…," but was soon interrupted by the director. 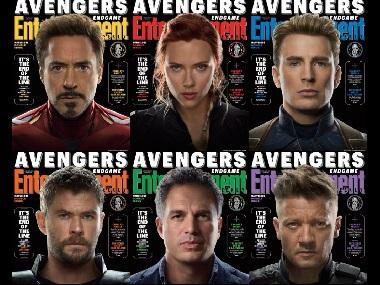 Given that Avengers: Endgame marks the end of Phase 3 of the Marvel Cinematic Universe, Mark Ruffalo (The Hulk) remarked how "bittersweet" the moment was. “As actors, we’re like vagabonds. We kind of bounce around. We have these intense relationships and then you don’t see anybody until you get nominated for something or you’re nominated in something and you end up at an awards ceremony,” he was quoted as saying by Entertainment Weekly.